The 2018 Nickelodeon program aims to help develop Chinese creative talent and attract passionate young people to work in the animation field after graduation. Students will be participating in course modules conducted by international VIMN and Nickelodeon executives who will be sharing their expertise and knowledge in research, storytelling and character development, animation skills and commercialization. It is the first international academic program, which the university is making a concerted effort to integrate these international masterclass standard courses as core modules within the undergraduate animation degree at the School of Animation and Digital Art over a formal semester. The 2018 academic program is an expansion of the Nickelodeon program, which started as a summer workshop last year. “The Nickelodeon program is the most extensive international academic program conducted at our university. The quality of the curriculum is exceptional with well-thought out real-world subjects like commercialization, brand management and marketing. We are grateful to have such an in-depth collaboration with both Viacom and Wellcome Forefront this year,” said Mr Duan Peng, Vice Principal, Communication University of China. 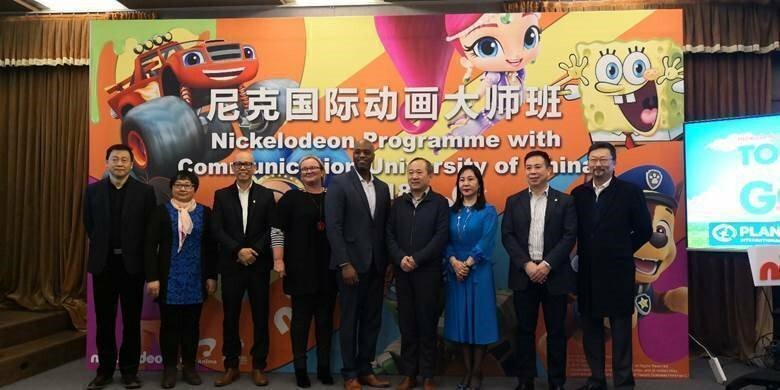 “This was an easy decision to support the Nickelodeon program with the Communications University of China, especially given Nickelodeon’s wide recognition in China and of its iconic characters. We are delighted Viacom is committed to help further develop the Chinese kids’ animation industry through talent education and skills development, while tapping on the best of Viacom and Nickelodeon’s expertise, practices and resources from around the world. This is a rare and exciting opportunity for our local students to learn from the international experts,” said James Chen, CEO, Wellcome Forefront. “We see greater potential than ever to develop iconic animated characters for Nickelodeon who don’t just entertain on-screen but also generate significant new licensing opportunities off-screen. It’s important for anyone seeking to work in animation to understand how the sector works commercially and what’s involved in building a global franchise. We see a lot of animation talent and potential in China and are committed to an on-going collaboration with the Chinese authorities and institutions like the Communication University of China to help develop the local sector,” said Gerald Raines, Senior Vice President, Location Based Experiences for Viacom International Media Networks. In October this year, VIMN launched the inaugural Nickelodeon Chinese Animation Development Project, which is expected to drive new animation co-productions in and with China. Supported by China’s National Radio and Television Administration (NRTA), the first initiative announced to be backed by the Project is the confirmation of another collaboration deal with iQIYI to develop the second season of iQIYI’s original children’s animation series, Deer Run* [*working title]. Wellcom Forefront (Beijing) Culture Media Corp. focuses on establishment, promotion and development of theme parks, resorts and related industries, as well as animation education and industrial parks in China. Wellcome Forefront (Beijing) Culture Media Corp.